After more than 50 inches of rain in four days, Houston was less of a metropolis and more of a muddy brown swamp. With the flood came destruction. Homes and pets and businesses disappeared over one weekend of devastating flooding. Businesses were shut down and employees were rushed out of the office with nothing more than a moments notice. With another hurricane on its way, now is the perfect time to think about implementing a disaster recovery plan for your business. If Hurricane Harvey has taught us anything, it’s that the reality of data loss is a matter of when, not if. We recently talked about How Cloud Technology Can Help Your Business. As we prepare for Hurricane Irma, let’s take a look at the importance of disaster recovery and how you can implement it for your small business. A disaster recovery plan retrieves your IT data in the event of a major disaster. 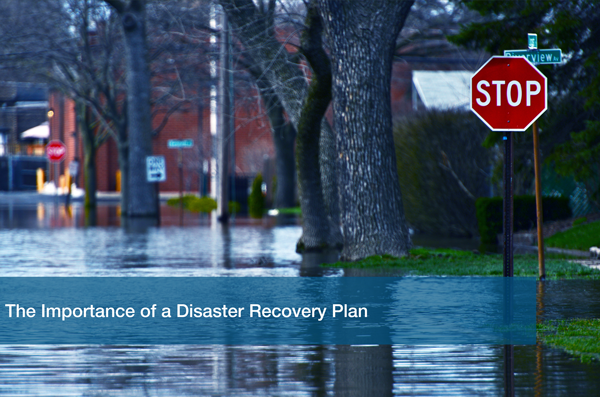 The plan offers steps to help before, during and after a catastrophe strikes. A disaster recovery plan ensures that no matter what happens, your data is safe and basic applications are up and running ASAP. Implementing a disaster recovery plan in your business will help reduce downtime and data loss. Small businesses cannot avoid disasters, but with meticulous planning the negative effects on a company can greatly diminish. With high dependency on technology to run a business efficiently, a disaster recovery plan should be at the top of your list. Many times, businesses fail because they aren’t prepared for an IT catastrophe. Having a plan in place will provide you with a sense of security, minimize risk of delays, minimize the decision-making process during an issue, and much more. When a devastating event takes place and causes daily operations to come to a halt, a company will need to recover as soon as possible. Downtime is a nightmare and one of the biggest IT expenses that any business can face. The ability to continually provide service to clients will keep you and the customer happy as can be. Don’t lose your clients over a preventable lack in service. Save money, save time, and save your business. There is no right type of disaster recovery plan, nor is there a one-size-fits-all type of plan. However, there are many different ways you can implement a strategy ideal for your business. A plan could be as simple as backing up your data or as complicated as placing your servers in a top tier data center miles and miles away. The disaster recovery plan specifies exactly how a company will prepare for a disaster and what their response will be. No business is safe from IT disasters, but a well-crafted plan will help your business persevere. Creating, implementing and maintaining a disaster recovery plan might be time-consuming, but it is important to ensure your business’s survival. Here at ITC, we will help craft the perfect disaster recovery plan for your small business. To protect your company from unexpected disasters call us today to Schedule a Free IT Analysis.